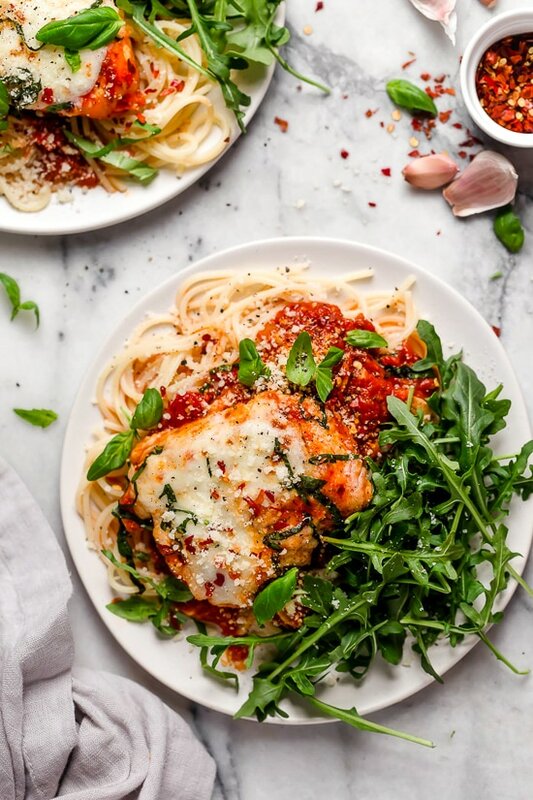 This quick and easy Chicken Parmesan is the answer to your weeknight dreams!! And since it’s made in the Instant Pot, it’s ready in minutes! Don’t get me wrong, my family LOVES my Baked Chicken Parmesan recipe, so I was skeptical. No breading, no frying – sign me up! And since we are cutting down on the carbs this month, this was a no-brainer! Of course, if your family wants their pasta, feel free to serve it on the side (I had mine with zucchini noodles). This recipe is from Melissa Clark’s new cookbook Comfort in an Instant (affiliate link) which features 75 recipes for the Instant Pot, pressure cooker or multi-cooker. This recipe happens to be on the cover, and although there were so many I wanted to try, this is the one I was craving. I ever so slightly adapted this using a little less oil, but otherwise made it exactly as written. Melissa recommends broiling the finished dish if you have a few minutes to spare to get the edges golden brown and crisp – totally optional! 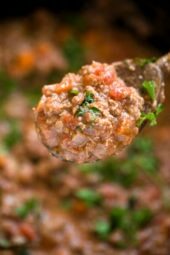 She also recommends adding chopped olives, anchovies or capers with the sauce for more flavor, if desired. I have the 6-quart Instant Pot (affiliate link) which is perfect for a family of 4. If you have a larger family I would go for the 8 quart. You may also enjoy these Instant Pot Recipes. Using the sauté function (on low, if possible), heat the oil in the pressure cooker pot. Stir in the garlic and cook until just turning golden, about 2 minutes. Stir in the marinara sauce, 2 tablespoons of the Parmesan, and 1/4 teaspoon pepper. Increase the sauté heat to medium. Season the chicken with the salt, oregano, and pepper to taste. Nestle the cutlets into the sauce, overlapping as little as possible, then spoon the sauce over to cover the chicken. Lock the lid into place and cook on low pressure for 3 minutes. Manually release the pressure. Sprinkle the mozzarella and the remaining 1 tablespoon Parmesan evenly over the chicken. Cover the pot with the lid (but don’t lock it on) and let it sit for 4 to 5 minutes to melt the cheese. Serve as is or, for deeper flavors and a little bit of crispiness, broil the cheese until golden and bubbling: Heat the broiler with a rack 4 inches from the heat source. Scoop the chicken and sauce into a greased small rimmed baking sheet, trying to keep the cheese on top. Broil until the cheese has browned, 2 to 3 minutes. Sprinkle with basil, if desired. Reprinted from Comfort in an Instant. Copyright © 2018 by Melissa Clark. Published by Clarkson Potter, an imprint of Penguin Random House, LLC. Plugged this into WW and got 3 freestyle points instead of 4. I think it’s because I’m using shredded part-skim mozzarella instead of fresh. But hey, I’m not mad! Is no water needed to bring up to pressure? It would have been great to update the website to show what BURN meant on my instapot. I’ve used this many times for a year, and never saw that. If folks keep commenting about it (which I later saw), please explain in the instructions to let the pot cool after sauteing, and prior to pressure cooking. The recipe did taste good, just some minor burnt tomato sauce to scrub later. Thank you for posting this! I have tried this three times and always get the burn message. I googled it and read to add more liquid and must have just got lucky the first time because it fixed it, not the case for try 2 and 3. It tasted so good the first time so was worth trying again but was about to give up after having to throw out try 2 and 3. I had no idea I was supposed to let it cool, but will try that for attempt number 4! My husband is from New York and loves Chicken Parmesan. He doesn’t normally love my cooking but always eats what I make. Tonight he couldn’t eat it fast enough and if I had made more he would have eaten it all. He couldn’t believe it was made so quickly and it wasn’t fried. He said please make this again soon!!! I made this as written except I didn’t melt cheese in the instant pot…. I took it all out and put it in a dish and broiled for three minutes. I have a new instant pot but had zero issues with the ‘burn’ signal. The taste was really good but the chicken was over-cooked…. I wonder if the short time under the broiler did this? I may try two mins next time in the instant pot. One other thing…. there’s LOTS of cheese. Don’t get me wrong… it was delicious, but if you’re watching calories, you can easily half it. I do not have an instant pot. If I wanted to just bake these at what temperature and how long would I do it? Here is the baked chicken parmesan recipe. This recipe is amazing. Chicken is so tender, cut it with a .fork. How thick should the cutlets be? I’m nervous about overcooking them. Can you double the recipe or is it better to make 2 batches if you need more? loved, loved, loved…… super easy, really fast, but best of all it was DELISH!! Will make again, soon! I made this a few weeks ago and my family enjoyed it. Didn’t know how much they enjoyed it until my husband requested for his “special” Valentine’s meal. Definitely put under the broiler! Added some mushrooms to the sauce also. Delicious! 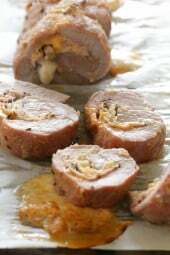 This recipe was very yummy and my husband does not comment unless the dish is really good. I will use a different marinara brand next time since mine was a little thin. I would definitely recommend it. I used breasts but pounded to tenderize them and then cut them in half. Perfect!!!!! My instant pot doesnt have the option low pressure. I left on the sautee. I didnt eat yet but it looks fine. Which option should i use? How do i broil? I love chicken parm but always get it fried/breaded so I thought I wouldn’t like this. I was wrong! IT IS DELICIOUS!!!! I made it with a side of cut green beans in tomato sauce instead of any pasta and it was amazing! Leftovers heat up well too!Gina, do you have a (Greek) green beans recipe? (Fasolakia). It’s like you are eating a side of penne! Can this be made in a slow cooker, rather than Instant Pot? This recipe was superb. So quick and presents beautifully. Really quick and easy (especially when you already have your marinara prepared. I cooked the chicken the night before, then transferred to a baking dish for a quick prep meal the next day. Reheated in the oven and added the cheese at the end and broiled it. My 8 year old raved. Probably one of his favorites (among 300 other of his favorite skinnytaste recipes! Haha!). Valerie, how long did you put it back in the oven the next the warm it back up? With young toddlers this would be much easier to make during nap and then do the oven step at dinner- would love to hear the times you did in regards to reheating! So I have made this 3 times for my family (3 boys 11-15). Everyone loves it – you can make it ahead and reheat for weekday meals. No one complains that it is not “Chicken Parm” because the flavors are soooo good. Cannot recommend enough. So easy and great taste. Regarding the fresh mozzarelka cheese, fresh is usually in balls and very soft, so how does one grate it per the recipe? If you can not find larger ones or have trouble grating the small ones, you can just chop into smaller pieces. Hi Gina, I follow Melissa’s recipe too. Thanks for adapting this recipe and I really appreciate it. I’ll try it out but wanted to ask if the total time you wrote (18 min) is actually accurate? Because sometimes when I follow your recipes it takes me almost double of the total time. I apologize if the question sounds dumb! So simple and yet so much flavor! This was delicious and I will definitely be making this again. I used a jarred marinara because I made this on a work day: Organico Bello organic marinara. I chose it because it’s low in salt and sugar and only has 45 calories per 1/2 cup. I also recommend using the fresh basil because it adds so much flavor. When you cover the chicken to cook for 3 minutes do you keep it on saute? I’m new to Insta-potting! no, shut it off so you dont get a burn notice. Made it the way it was written. I broiled it in the oven. It was fabulous! A keeper! I served it with butternut squash noodles, when together very nice. You do a wonderful job of making these recipes healthy, easy and fun! Thank you! If I wanted to add pasta to this would I do the pot in pot method with pasta on top of the chicken? This was DIVINE and oh sooo easy! A huge hit at my house. This is a wonderful dish to make for my family. It is a wonderful thing to consume. There are many many many many different flavors. Which is why I absolutely hated the dish, my other family liked it, i thought it was rather unpleasant. I would prefer my usual salad and chicken Parmesan. I made this tonight. It is quick and easy. The recipe creates a good flavor on the chicken. I used two cups of Marinara instead of 1.5. I also needed to pressure cook for two minutes longer. I’m using a Ninja Foodie so be sure you check your internal temp on your chicken to make sure it’s done. The great thing about the Ninja Foodie is that I can put down the crisper lid to broil the cheese. Super easy and delicious! Made this twice last week, it was so stinkin’ easy and delicious! I used a pasta sauce that we had on hand. Noticed it was oily afterwards, so maybe higher points count due to that. I think next time I’ll add mushrooms and some thick-sliced onions because, why not?! Ive been cooking your recipes all day lol ,Crustless zucchini pie is one of my favs, I cannot believe how delious this is , so moist and tasty ! I’m new to the instant pot so thank you for teaching me how to use it . This was very tasty, but it was not without trial and error. My IP kept displaying the burn message after almost sealing. I tried 3 times to deglaze and get it to stop saying burn, but it never worked. By the time I tried to seal it for the 3rd time, the chicken was cooked so I transferred it to a shallow pan to melt the cheese in my oven broiler. I would probably just make this again in the oven as it took me a lot of clean up time after transferring around all the chicken. I tried the IP Chicken Parm for the first time last night. The flavors were great, but the chicken was VERY chewy. I’ve seen that others are raving about it, so I’m thinking I may have done something wrong. When making it I noticed it called for “manual” release, which I assumed was the same as “quick” release. I’ve read on the IP site that meat should always be “natural” release, so I’m not sure if that was the issue. Or maybe I should have pounded the chicken (used thin cutlets)? Or maybe I should have seared the chicken to seal the juices? I’d love to make this again and would appreciate any help! Not sure, the recipe calls for thin cutlets cooked on low pressure. Flavor and ease of recipe get a 10! However, the chicken was totally tough- almost inedible. I used thin sliced breast like the recipe called for. I broiled it briefly. Wondering if I should try regular sized breasts next time. Did anyone else have this issue? I made it tonight, I used cutlets, didn’t have a problem. I was a little worried, but it worked. Do you think it would work to bake the chicken in the marinara sauce? I checked your baked chicken parmesan recipe and baking it without breading (so that it’s keto) or sauce sounds boring. Very good! I cut chicken breasts in half thickness-wise but should have still pounded them a bit to get them more tender…chicken was a bit tough (maybe the broiling is to blame?) I did sneak some frozen spinach in during the saute and it was a nice add. We tried this tonight. Wow, Wow, WOW! So easy and good! Until I found Skinny Taste, I didn’t realize how many great Weight Watchers recipes are out there. Thanks so much! This dish was so amazing! My husband is a diabetic so finding recipes that he can enjoy as well means so much! Keep them coming Gina! Do you think it’s possible to do this with frozen chicken? First skinny taste recipe I have ever tried and this was SO GOOD!! I can’t wait to try more but will definitely be adding this one to our rotation. Made this tonight for my family of 5 and 3 preteen boys. They loved it so easy and I can see this being a make ahead dish for weekday meals. Highly recommend. We made this last night. Talk about a QUICK AND EASY weeknight dinner to add to the roster!! We thought it was delicious! It literally took less than 5 minutes to get the chicken into the pot. YUM! I tried to triple this recipe in the 8 qt (~3 lbs chicken and 2.5 c sauce). I got the burn message. I took about 2/3 of the cutlets out (leaving six in), stirred, and gave it another shot at 5 minutes on low pressure. I immediately pulled the cutlets and a few spoonfuls of sauce under the broiler with cheese. It was super yummy! I put some of the remaining sauce with the other breasts that I had pulled out earlier and cooked at 400 for 20 minutes. Those look good too. Served over whole wheat spaghetti and zoodles to good reviews from toddler and husband! This is definitely going in our regular rotation! My 6 qt. Instant Pot Duo went to “burn” as well. I noticed right away and the lid was not yet locked for the pressure cycle so I was able to pull everything out and finish it in the oven. It was delicious, just not sure why it didn’t work in the Instant Pot. Thank you for all of the great recipes! Holy cow this was AWESOME!!! It took no more than 10 minutes to make and everyone cleaned their plates. Will make this again for sure!!! I made this last night for my husband and I….and it was sooooo goooood! I do have an Instantpot Duo 6 qt (the newer one) and I did get the ‘burn’ message. I used Mezzetta’s pasta sauce which isn’t too thick but apparently the cooker thought so. I de-pressurized it, added about a 1/2 cup of chicken broth, and restarted the Instantpot. That was the missing link to getting the ‘burn’ message to not reappear. Maybe suggest this to others in your content…it’ll save others the frustration. I served it with sautéed spinach and some arugula salad that I had on hand. DELICIOUS! Thank you, Gina! I made this and got the burn message multiple times. My suggestion would be to either skip sautéing the garlic or just add it to the sauce. I ended up canceling and then restarting it after scraping the pot as suggested when I googled how to save my instant pot recipe! It took another 20 minutes to attempt to re-seal but got the burn message again. By then the chicken was cooked so I just broiled it with the cheese for a few minutes. I would make this again but skip the sautéing step. I made this last night & it was so good! Even my picky 9 year old liked it! Love this site! 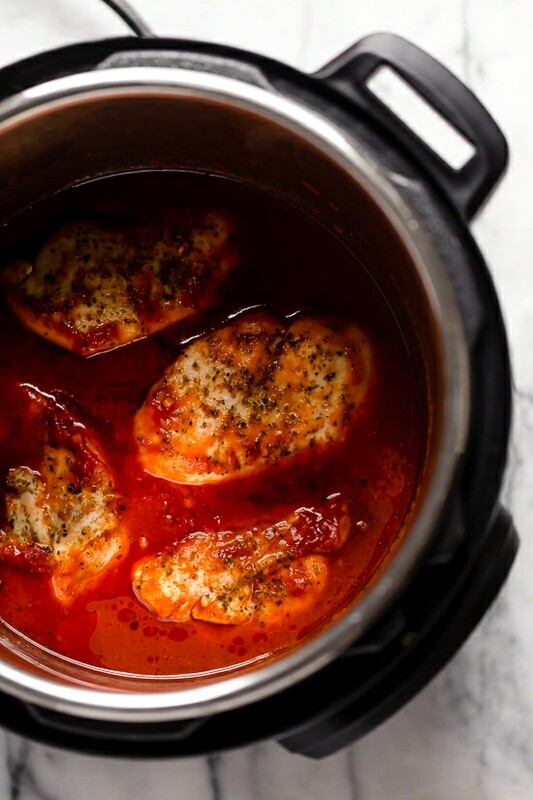 My kids loved this even more than your original baked chicken Parmesan recipe! I found it was easier to scoop out the chicken/sauce and then add the cheese and put it under the broiler. Well worth the extra step to get it looking like your photo. This recipe will get added to our regular rotation because it’s perfect for busy sports nights. By the time I had made a salad, chicken was done. Made this tonight and it was delicious! The whole family loved it! Thank you for all you do Gina! First recipe I’ve ever gotten a burn notice on and I’ve had an IP for over a year. 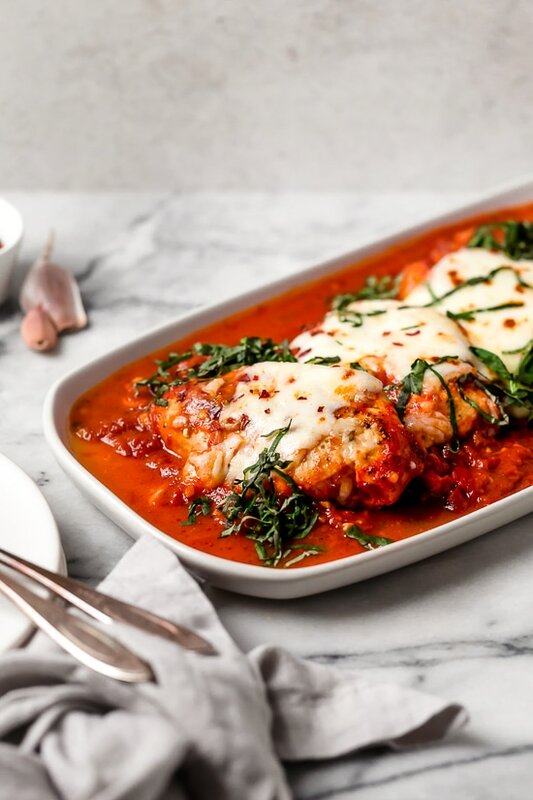 I’m quite mad because out of all the chicken Parmesan recipes, I made this one – and my dinner was ruined because it burned to the pot and left a burn flavor.I added extra liquid, too. Still burned. Wish I would’ve known that burning was a possibility. I am noticing this happens to newer models, 8 quart only. Curious which one you have? I am making the recipe and wanted to confirm that you cook it for 3 minutes with the chicken? Can I use thicker chicken? I have 4 4oz pieces of Chicken breast on hand and would like to use that. Fantastic – hubby loved it too! Made this the same night it came via e-mail. Hubby and I are both on low-carb diets. Only the 4th time to use my new Crock Pot multi-cooker and it worked like a charm. Skipped the broil stage. Simple to make and tasty!. I tried making this and every time I got the burn message. So a quick 10 minute dinner ended up taking 2 hours to get through the burn messages. I kept having to add chicken stock, and then it turned into chicken parm soup. 🙁 HOW do I avoid the constant burn messages? Once I finally got it done, the bottom of my Instapot was black. In the end it tasted great, but not worth the hassle. I have a brand new one I got for Christmas. I was having the same issue. It has to do with the sautée function. You need to make sure there is nothing on the bottom. Good morning, Gina. Can you tell me if this can be doubled? You mention not to overlap the chicken. Is there a reason for this? I have the 6-quart and want to make for 6-8 people. Will it ruin the end results if I prepare with 8 cutlets? Seems like many people did with good results. The best chicken Parm ever! We pulled it out of InstantPot and threw on some breadcrumbs and cheese and put under broiler for a few minutes. Delish! Love that you are providing low carb recipes. I have a couple of your cookbooks, as well as your email recipes. Really enjoy reading and trying different ones. I do not have an instant pot. My husband is considering getting the Ninja Foodie when it’s a good price. He likes the crisping feature. Is the pressure cooker part of the Foodie the same as an instant pot and would I follow your instant pot recipes the same way if using the Foodie? Since I dont have one I am not sure? This was pretty good! We have an 8 qt so used 2 cups of the marinara sauce – it worked perfectly. We did not do the broil step but next time I would try to add a little extra flavor/crisp. Can I make this in a crockpot? My guess is yes but I think it would be watery and not as good. 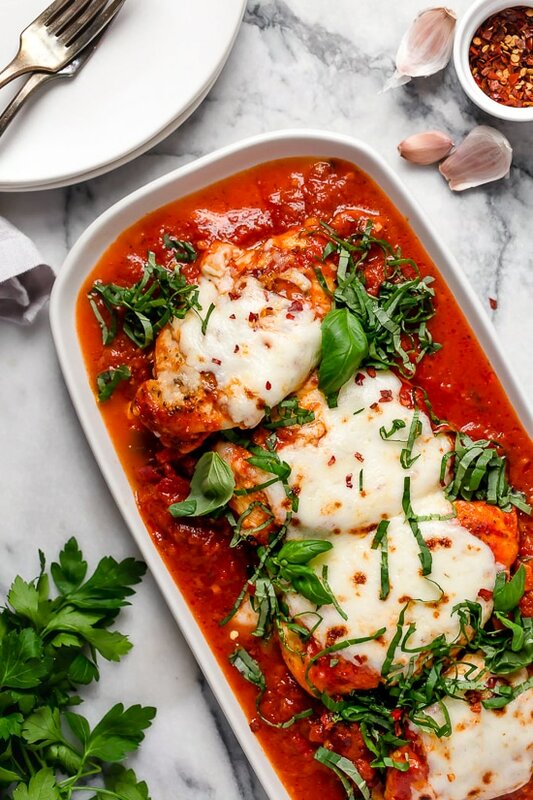 We love your baked Chicken Parm recipe and have made it dozens of times over the years. I was skeptical.. 3 minutes in an instant pot? No breadcrumbs? The original recipe writer, Melissa Clark, is amazing so we gave it a go… and it was incredibly delicious. The sauce was really great, the chicken incredibly moist and we did brown at the end although a previous commenter wondered about doing the cheese in the broiling process – I agree, would be way less messy. But we made it exactly as written and it was simply sensational. It will replace the Baked recipe in our house going forward. We will sneak some mushrooms in at the beginning next time too. Thanks as always! We’ve now made it three times in 8 days. This recipe is bulletproof. Please add some olives or capers to sauce and also def. broil it. It’s done so fast. All of the Gina Chicken Parmesan options are great but this one may now be the king of our fav. dish. Thanks Gina and Melissa! Gina, this is a great recipe! I used my Ninja Foodi, so I added 2 more cutlets because the pot is wider. I also added another 1/2 sauce just to be safe. I still cooked it for 3 minutes on low pressure, then used the Foodi’s broil function at 400 for 4 minutes. It was quick, delicious, and so easy!Thank you! My daughter and I made this tonight and it was so good! I couldn’t stop eating it 🙂 We will definitely be making this again. I highly recommend it! This was Delicious. Oh my gosh. The whole family loved it. Thank you. Could I make this with frozen chicken breasts? How would I need to alter the timing? Thanks! Looks delicious! Lauren, I’m looking at this recipe now myself and was wondering that too. I just got my insta pot at christmas so am very green but part of why I wanted it is because I’m terrible at meal planning so when I can cook from frozen to done in a short time I was sold! I’ve read up on this some and experimented. I don’t alter the time when the chicken is frozen and everything is fully cooked. Someone said (although I haven’t timed it) that it takes the pot longer to come to pressure when the chicken is frozen, so that makes up for the extra time people think it requires. Always works for me. Hi Gina this sounds delicious- can I ask about the 4 freestyle points – does this relate to weight watchers (WW)? Thank you! I’d like to double this recipe. Is there a reason the chicken should not overlap? Thank you for all your wonderful recipes. I have all 3 of your cookbooks and cook with you multiple times a week. I am sure it will be fine as long as the sauce covers the chicken. Can you use a pressure cooker in place of instapot? Is there enough liquid in there to make it reach pressure and not get the burn message? I followed the recipe from the book and had no issues. I know some newer models get that often, so I am not sure? I got the burn message. I stopped and added ~1 cup water and it was fine. I think my sauce was too thick? Since you said the cutlets shouldn’t overlap, I wonder if you could double this recipe? I’d love to make it for a family dinner. I have not tried but I don’t see why not. I just did that and it turned out fine. I had seven cutlets stacked up in there. I have the 6-quart duo. I think that matters. Then when it was finished I put it in a casserole dish put the cheese on it and put it in the oven for a few minutes on 350 to melt the cheese that I turn it on broil to Brown it up a bit. Hope that helps! It was delicious! By the way I use Paul Newman’s organic marinara. If you’re going to broil it at the end to finish… why not just add the cheese on top of the chicken after removing it from the IP and putting it in the broiling pan? That way you wouldn’t be dealing with trying to keep the melted cheese on when removing the chicken from the IP. This looks great but is there an oven version of this recipe? 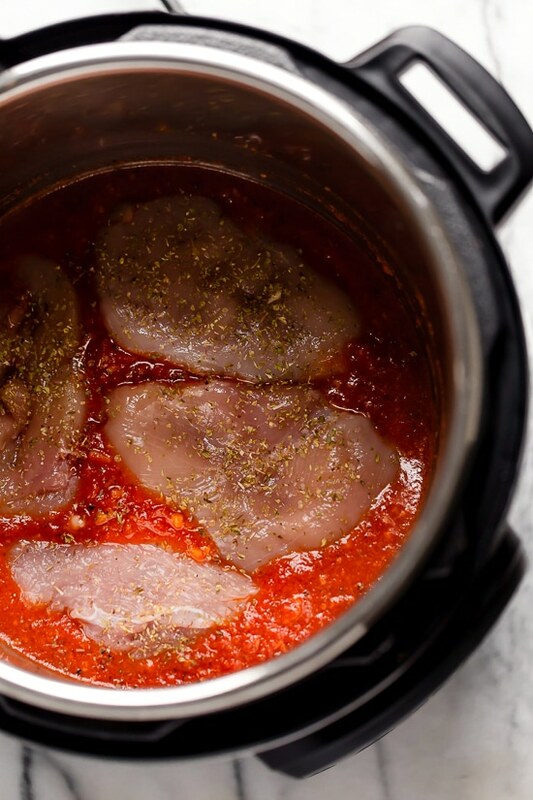 Do you have a recipe for “plain” chicken in the instant pot? Looking for a good way to make-ahead-chicken for the week, that I can add to “anything” for some extra protein (it’s zero points after all). I tried just broth and bullion and it was eh, too bland. And I didn’t use enough broth so it was dry, but I was sparing because I didn’t want soup. Would love your advice. Thanks! I’ve had alot of success with rubbing some seasoning into the chicken and browning on saute before adding liquid and cooking. I do a variation of Gina’s salsa chicken that uses a half cup of salsa and a half cup of broth. You need at least a cup of liquid when doing chicken in the IP. 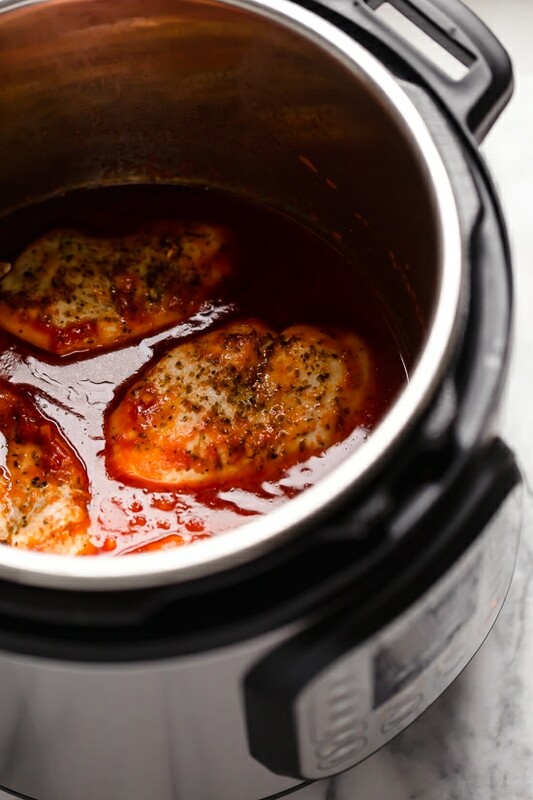 I steam chicken breasts in the instant pot to put in salad, etc… I put a cup of stock or water in the bottom of the pot, put 4 chicken breasts (sprinkled with salt, pepper, and basil) on the steamer basket, cook on high pressure for 10-12 mins (depending on the size of the breasts), and do a quick release. I made this dish last night and it was really good! You don’t get the “burn” message? I did not. Followed her recipe with no issues. Feel free to add more sauce if you think yours will. I am not sure why it worked fine for me and many others here, but not everyone. Sounds like a flaw with the Instant Pot. Seems 8 qt has this issue. nI ever got the burn message in my Instant Pot Duo. I.n the Ultra, I get the burn message, especially with Gina’s goulash. I Googled it, and apparently it’s a problem with the newer Instant Pots. My solution is to let the pot cool down after the sauté step, then add the rest of the ingredients, stir and scrape the bottom thoroughly, then put it on pressure cook setting. The other solution was to use a pot on the wire rack–called pot-in-pot–but that means you can’t sauté without cleaning out the pot before proceeding. I got the burn message but it looked like it was from the chicken sticking to the bottom. I am not sure how that happened :(. Just took it out and put it in the oven to finish cooking. What size Instant Pot do you have? I’m not sure I’d be able to fit all four cutlets on the bottom of my 6 qt pot without overlapping, but I’m going to try! This looks great! If you were to use chicken thighs, how long would you cook them for? We used boneless, skinless thighs, slightly pounded, with the same 3 minute cooking time. Turned out great and the dark meat added wonderful flavor. 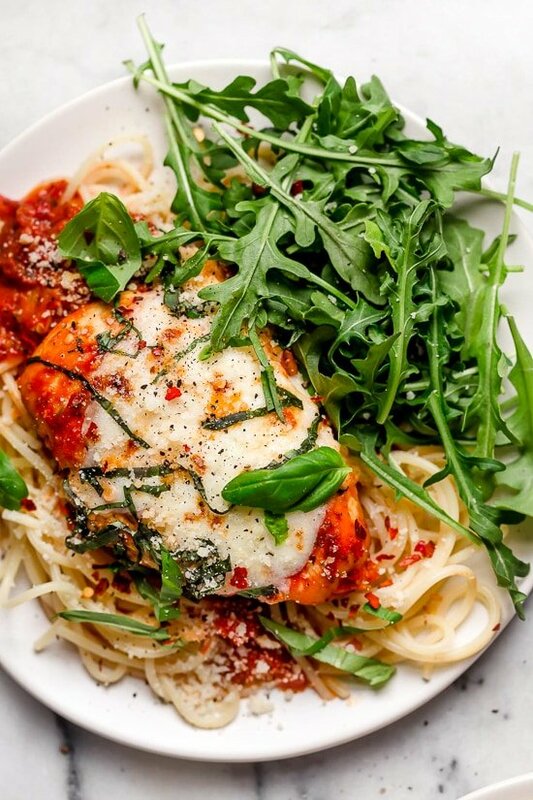 Her baked chicken Parmesan recipe is easy and delicious! The recipe is on her website! These sound delicious. I love that they arelow carb. I do not have an Instapot. 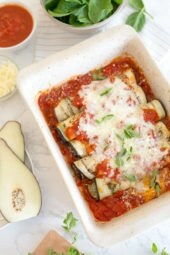 Can I adapt this recipe to a baking dish? Sure follow my other recipe I linked. This sounds delicious. I do not have an instapot. Could I bake this in a casserole dish? Instructions on how? I love your recipes and love your breaded chicken parm. This is nice to be low carb. I am making your one pot spaghetti and meat sauce in my Le Crueset Dutch oven this week. This is next on the list. French onion soup burgers were on the menu last night and tonight from One and Done. They are addictive! You hit it out of teh park as always! Chicken enchilada roll ups before that! Your recipes are amazing! Thank you so much for all of your hard work! All of those recipes are our favorites. Especially the Enchaladas. You really need to get an instant pot. I was skeptical but love ours. Hi Gina, I just wanted to thank you for all your efforts on recipes recently. I see a lot of delicious meals in my future, thanks again for all your hard work! Sounds delicious!!! What’s the purpose of step #2 though? You already have sauce in there and just are adding chicken before pressure cooking. Why change the sautee setting? I made the recipe last night and as I was reading the recipe I was wondering the same thing. I think it is to warm up the sauce so its nice and hot when you put the chicken in. My instant pot doesn’t have a low pressure setting, how would I cook this? High pressure is fine then. I spray the bottom of the pot with nonstick spray and then add the oil , so far I haven’t had any sticking!